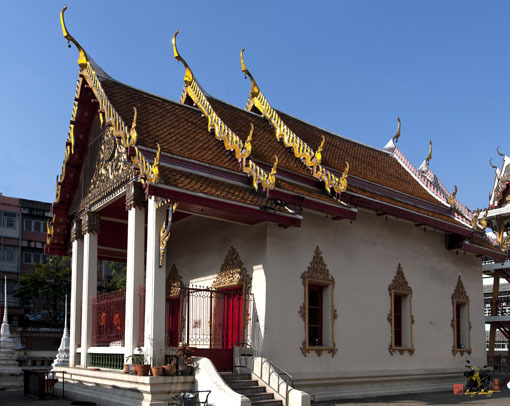 Wat Disanukaram, วัดดิสานุการาม, located on Dismark Road and Worachak Road in Bangkok, Thailand, is a public or civil temple of the Maha Nikaya Sect. 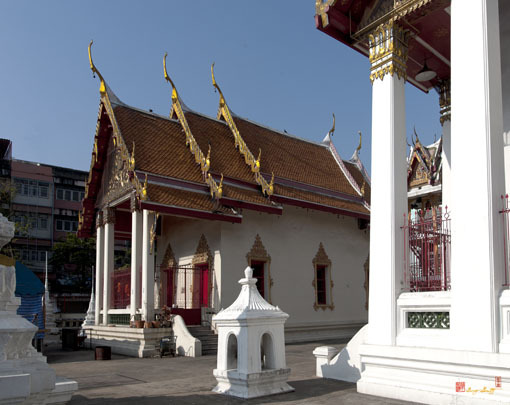 It was formerly known as Wat Chang Wang Dit after its builder. 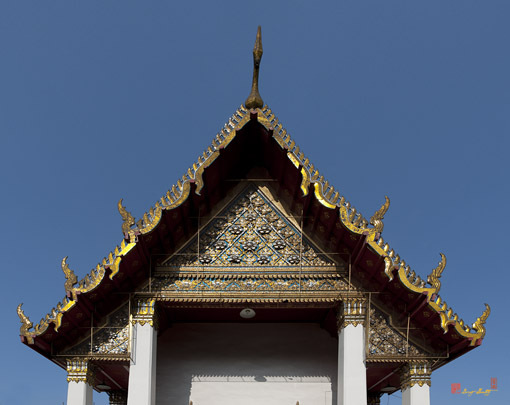 Presumably it was built in the reign of Rama III, King Mongkut, who renamed it Wat Disanukaram. 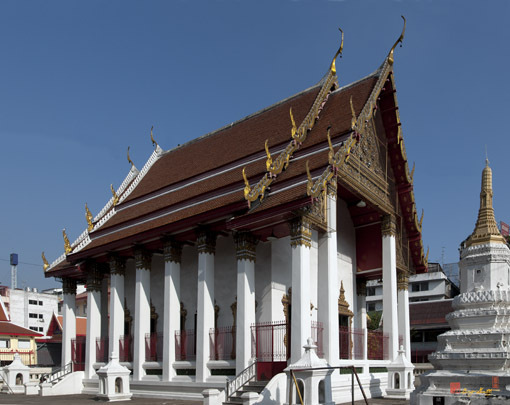 The Ordination Hall or Ubosot is based on an elevated platform, surrounded by a gallery. 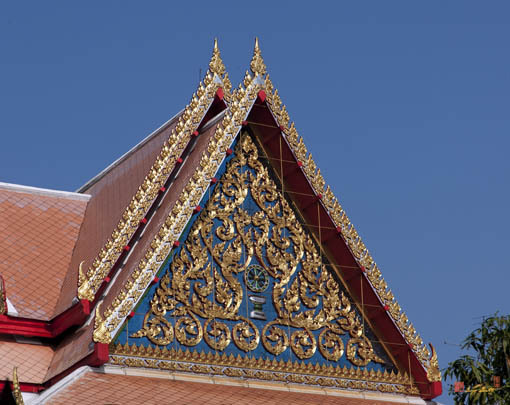 Its two-tiered roof is fitted with gilded and stained-glass decorative pieces. The gable ends are decorated with stained-glass floral Motifs. The Window niches are of a crown design, decorated with various stucco rose motifs. The door panels are of inlaid mother-of-pearl floral designs. 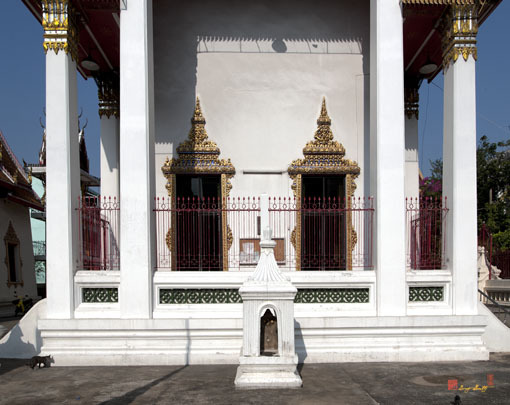 The window panels are gilded and lacquered with a Ratchawat design. On both sides of the entrances to the Ubosot and at the stair bases of the gallery are mythical lions of plaster. The lower part of inside walls are of marble and the upper part features murals. The panels between the windows are painted with stories from the Ten Lives of the Lord Buddha. The top is a painting depicting an assembly of deities. 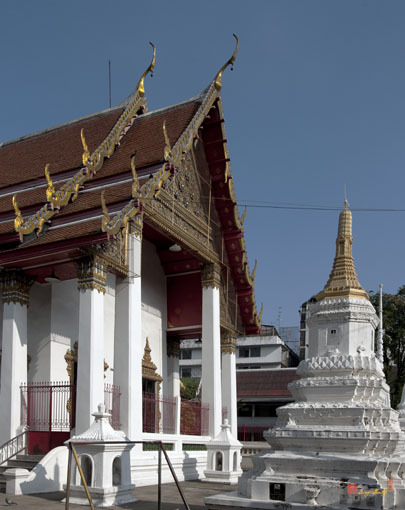 The wall opposite to the Principal Buddha image is painted with the episode of the division of the Lord Buddha's relics. The wall behind the Principal Buddha image depicts the episode of the Lord Buddha's subduing the Mara. The inside of the door panel shows an image of Chiao Kang. The window panels are decorated with pictures of guardians or yakshas. 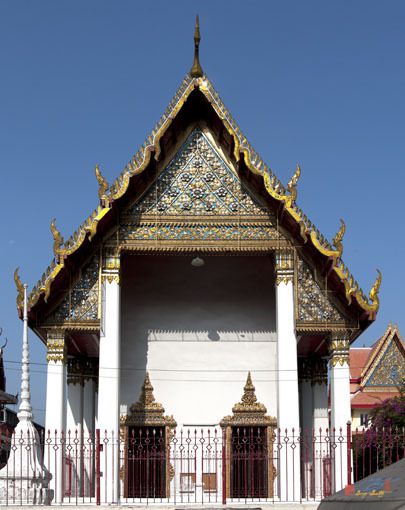 The Vihara is of the same style as the Ubosot, but smaller in size and with a three-tiered roof. 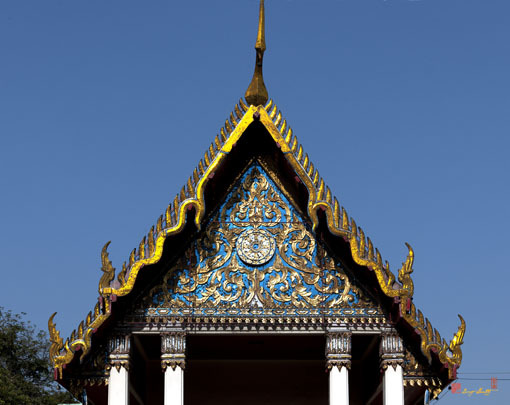 The gable ends are decorated with the Dhamma Wheel surrounded by a floral motif. The niches of the windows and doors are decorated with various stucco rose motifs. The floor is made of marble.